Enjoy exclusive access to special resources and events and support the 500,000 people in Scotland with dyslexia. Click here to see our Spring 2019 magazine which is all about dyslexia and studying. As a member of Dyslexia Scotland you not only help to maintain your local branch, but you also directly contribute to the support we offer to thousands of people across Scotland. Membership also gives you exclusive access to the specialist resources in the Members’ section of this site. These include teaching aids, more information about our activities and presentations from events. The chance to have your say at the charity’s AGM. Individual, family, concessionary (under 16, over 60, student, unemployed): quarterly magazine, discount on assessments and our Education conference. Access to our resource centre and members area on our website. A percentage of your fee goes to your local branch. 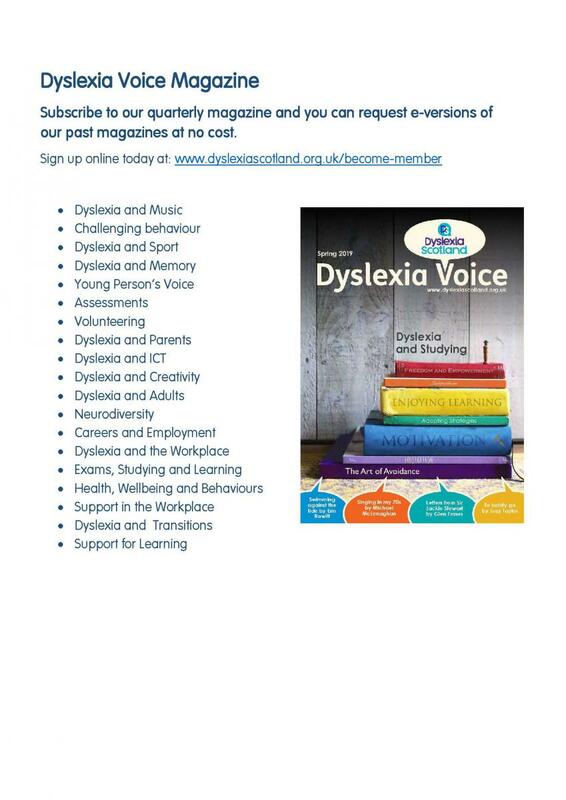 Tutor (Dyslexia Scotland approved Tutors): quarterly magazine, discount to our Education Conference, quarterly Tutor Seminars. Access to our resource centre and members area on our website. * An awareness card will tell others that the person carrying the card has dyslexia and may need help in some situations. If you opt for membership with an awareness card it will be sent to you with your next mailing. Alternatively you can join using the printed membership form at the bottom of this page. To join as a registered tutor follow the steps on the Become a Tutor page, or renew your existing membership on the renewals page.